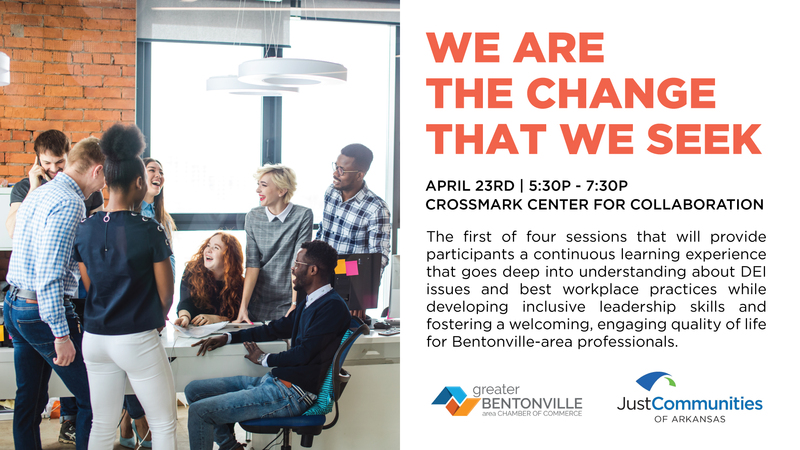 Partnering with Just Communities of Arkansas, The Greater Bentonville Area Chamber of Commerce has produced CRAFT (Community Retention and Attraction of Future Talent); programming around Diversity, Equity and Inclusion. This innovative and trans-formative program is a key stone of the Chamber’s equity-driven economic growth and diverse talent initiatives and will provide participants a continuous learning experience that goes deep into understanding about DEI issues and best workplace practices while developing inclusive leadership skills and fostering a welcoming, engaging quality of life for Bentonville-area young professionals. This four part CRAFT session will be geared towards emerging professionals only; sessions for those leading our economy and community for the decades to come will be presented during the lunchtime hour. These sessions will be held from 5:30-7:30 and will include a few minutes for networking before and after the work hour. Light food and beverages will be provided.